Do you want to put the power of DiSC in your hands? The purchase of a bundle will include a personal EPIC Administration Account plus an initial quantity of EPIC credits, which are used for issuing Everything DiSC® and the Five Behaviors of a Cohesive Team™ assessments. The package includes account setup, up to an hour of free instruction on how to use the account, and free ongoing training and support. Starter packages are for new EPIC sub accounts only. For established self-administration accounts, please purchase additional credits here. As an EPIC account owner, you will have access to an online system that is available to you at any time, from any internet-ready device. 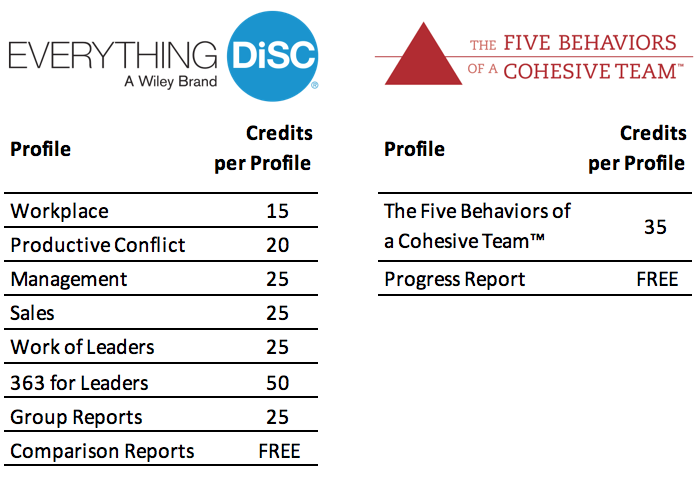 You will have the capability to issue access codes for individuals to take Everything DiSC® and the Five Behaviors of a Cohesive Team™ assessments, generate reports and view results from your own secure account.